"Love the room. Great space. Welcoming set up. Healing vibe. Mural really great.Felt very relaxed after the session. Great heat coming off your hands. Solid trust level, able to relax into it. A few moments when I had an internal reaction…… throat area, toes, left hip joint. All in all, I think it's a great start. Next time we meet, I'd like to give you a session so you can get a feel for my energy and style." 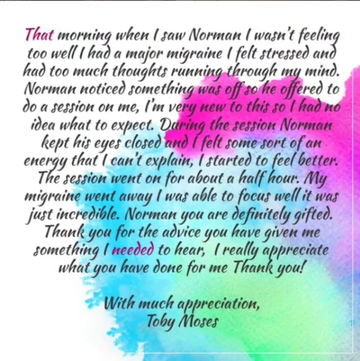 "That morning when I saw Norman I wasn’t feeling too well I had a major migraine I felt stressed and had too much thoughts running through my mind. Norman noticed something was off so he offered to do a session on me, I’m very new to this so I had no idea what to expect. 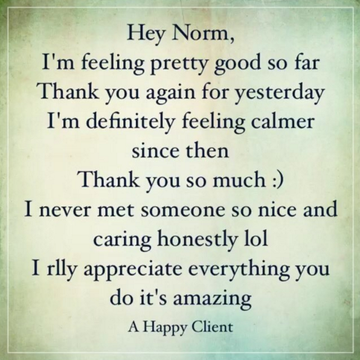 During the session Norman kept his eyes closed and I felt some sort of an energy that I can’t explain, I started to feel better. The session went on for about a half hour. My migraine went away I was able to focus well it was just incredible. Norman you are definitely gifted. Thank you for the advice you have given me something I needed to hear, I really appreciate what you have done for me Thank you!" 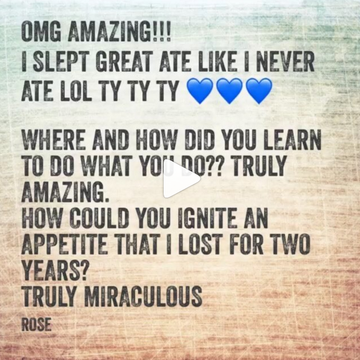 I slept ate like I never ate LOL TY TY TY  Where and how did you learn how to do what you do?? Truly Amazing! How did you ignite an appetite I lost two years ago. 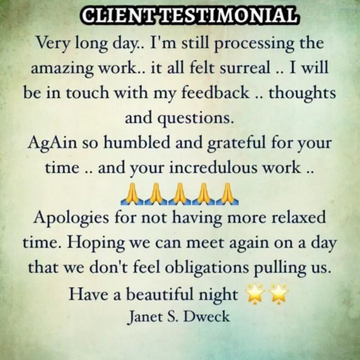 "I have been so blown away by my experience with your work on Wednesday. I am still speechless as you have shifted my way of thinking. I have to adopt one thing at a time. I have turned off the media. 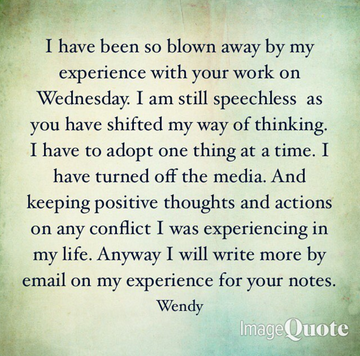 And keeping positive thoughts and actions on any conflict I was experiencing in my life. Anyway I will write more by email on my experience for your notes." 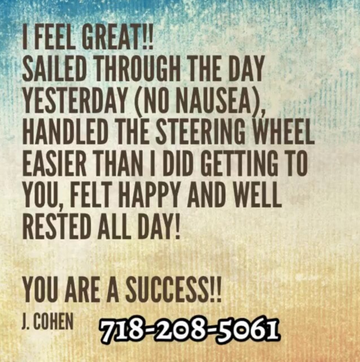 Sailed through the day yesterday (no nausea), handled the steering wheel easier than I did getting to you, felt happy and well rested all day! I’m feeling pretty good so far. Thank you again for yesterday. I’m definitely feeling calmer since then. I never met someone so nice and caring honestly lol. I rlly appreciate you do it’s amazing." I was deeply relaxed on the table and, after our meeting, I felt energized by your touch. On the bus ride home, I felt a slight crick in my neck but it quickly resolved. 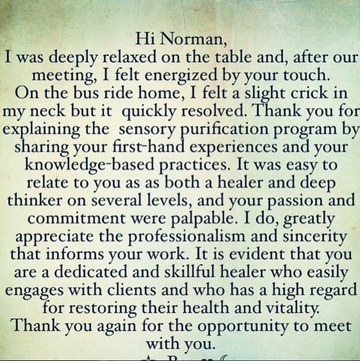 Thank you for explaining the sensory purification program by sharing your first-hand experiences and your knowledge-based practices. It was easy to relate to you as as both a healer and deep thinker on several levels, and your passion and commitment were palpable. I do, greatly appreciate the professionalism and sincerity that informs your work. It is evident that you are a dedicated and skillful healer who easily engages with clients and who has a high regard for restoring their health and vitality. Thank you again for the opportunity to meet with you. ​ ✫¸ ღ ☾ `• ღ`°♫ • ​☾`*`"
"Hi. Hope alls well , I sent you a short Facebook note , I’m not Sure if its anything to post . But I do see the potential for what your doing . 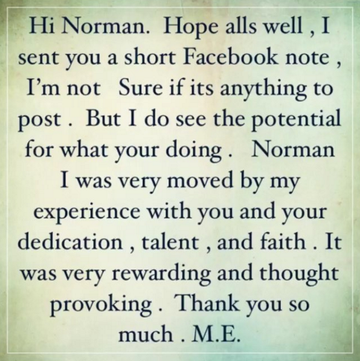 Norman I was very moved by my experience with you and your dedication , talent , and faith . It was very rewarding and thought provoking . Thank you so much ." "Very long day.. I'm still processing the amazing work.. it all felt surreal .. I will be in touch with my feedback .. thoughts and questions. Apologies for not having more relaxed time. Hoping we can meet again on a day that we don't feel obligations pulling us. Have a beautiful night "
" I feel good, I feel full, I have no craving. This is unbelievable. This is a miracle." “As I dealt with you in the past I find out that you know too much , that knowledge is because you have no limits on yourself ,and that why you always trying to do 120% perfect even though you capabilities (for example ) is only 80%!! You inside power it's the same as, high level of Kabbalistic .